Air compressors are most commonly used to power pneumatic flooring and framing tools. Go to any jobsite and you will see “those in the know” running pneumatic tools exclusively. Hardwood flooring, framing, and roofing all go together with air-driven fasteners. Fastening tools powered by an air compressor will save you time on any jobsite. Our twin-tank 1.5 HP Emglo electric air compressor produces 6.5 CFM @ 100 PSI in its 8-gallon tank. A single front wheel makes for easy transportation. Note: Rental rates do not include air hose. A great compressor for interior work – such as running brad nailers or flooring staplers – our Prime electric twin-tank air compressors are portable and tough. 2 HP motors produce a healthy 4.0 CFM @ 100 PSI in their 4.3-gallon tanks. Our largest front-wheeled air compressor, the gas-powered 5.5 HP Eagle units are happiest when on the job-site running strip nailers, coil nailers, or standard-crown staplers. Produces 12.5 CFM @ 100 PSI in their 10-gallon tanks. A single front wheel makes for easy transportation. Fifty feet long, 3/8” couplings. Adapters are also available for coupling to 1/4” fittings. If having an air compressor at your job site is unrealistic, but you still need air, pick up out 10-gallon portable compressed air tank. 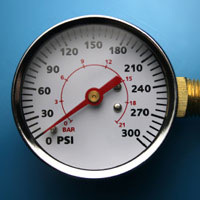 Maximum 200 PSI. Our Ingersoll-Rand 185 CFM diesel air compressor is in a class of its own. This tow-behind model uses high-quality rotary-screw air-ends which account for the 185’s high efficiency and reliability scores – these high numbers mean that the 185 a great choice for demanding equipment such as rock drills and hydraulic breakers. The 185 is also perfect for completing commercial irrigation blowouts. Equipped with all the necessary lights and fully licensed for towing, this portable compressor uses a pintle-style hitch to move it to and around the jobsite. Used with our 185 CFM compressor. Maintains output at a fixed pressure. Thirty feet long, 3/4” couplings. Used with the 185 CFM compressor above.